Japan Halts Some Beef Shipments Over Radioactive Feed : The Two-Way The Japanese government shut down all beef shipments coming out of Fukushima prefecture today, home to the damaged Fukushima Daiichi nuclear plant. This comes more than a week after tests on meat from the region revealed high levels of radioactive cesium. 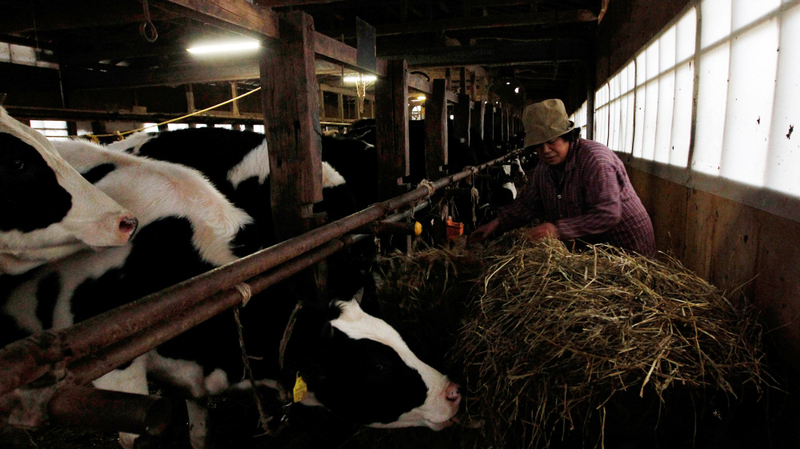 A farmer feeds her cattle at a farm in Futamata, Fukushima prefecture, about 28 miles west from the Fukushima nuclear power plant, on March 20, 2011. The Japanese government shut down all beef shipments coming out of Fukushima prefecture today, home to the damaged Fukushima Daiichi nuclear plant. This comes more than a week after tests on meat from the region revealed high levels of radioactive cesium, says the Japan Times. Some of the meat had been sold to consumers. Now inspectors are trying to learn whether local farmers fed their cattle hay or straw contaminated with radiation, according to Kyodo News. Japanese officials think the suspect the hay was stored outdoors after the March 11 earthquake and tsunami devastated the nuclear complex, according to AFP. It was later given to cattle that were then sent to meat processing facilities, and the beef was sold to consumers in nearly every Japanese region. The hay and cattle were outside the 12-mile safety zone set up around the nuclear complex, and it's not clear how far nuclear contamination may have reached.